Our entire healthcare team is committed to providing personal attention to the unique concerns of each individual pet owner. Thank you for taking the time to read about our veterinary practice and the services we offer. We welcome your comments and suggestions. Please contact us at (803)798-6252 for all your pet health care needs. 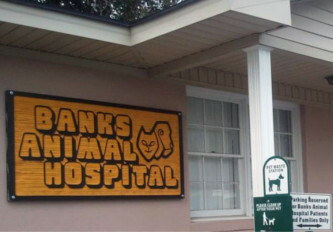 Banks Animal Hospital in Columbia, SC is a full service companion animal hospital with an extensive medical library, complete digital Radiology department, as well as, a complete pharmacy to better assist our staff in making a full and reliable diagnosis and treatment plan for your pet. It is our commitment to provide quality veterinary care throughout the life of your pet. Our services and facilities are designed to assist in routine preventive care for young, healthy pets; early detection and treatment of disease as your pet ages; and complete medical and surgical care as necessary during his or her lifetime. To also include our very own Class IV laser, which is designed to greatly improve the life and mobility of those suffering with degenerative or acute tissue damage, arthritis, and even promotes dermal and cellular regeneration from cuts, burns, or surgical scars. We also have the brand new Cryoalfa Innovative Cryosurgery technology that allows for less invasive removal of small skin growths (ie. skin tags, moles etc.). Every possible medical advancement available to us will be utilized to its fullest to ensure your pets well being and longevity.